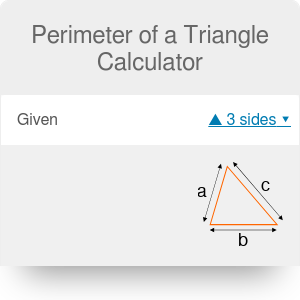 With our perimeter of a triangle calculator you can easily calculate the perimeter of that figure. The tool has the basic formula implemented - the one assuming you know all three triangle sides. But that's not all - our calculator is better than the other ones you can find on the Internet, because we've also implemented two other formulas for triangle perimeter, depending on the values you know. Isn't it awesome? If you are still wondering how to find the perimeter of a triangle or you are curious about the formulas for a perimeter of a triangle behind this calculator, keep reading. Check out our other handy tools: triangle area, right triangle and equilateral triangle calculators - these are a safe bet for your geometry problems. Perimeter of a Triangle Calculator can be embedded on your website to enrich the content you wrote and make it easier for your visitors to understand your message.